With up to 66 lbs. 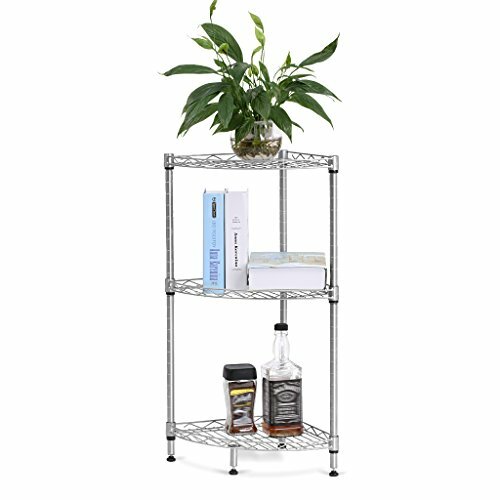 of goods capacity, LANGRIA 3-tier wire corner storage rack is perfect for saving space while remaining organized. Beyond utilizing every corner to maximize available space, our rack features 3 tiers of adjustable shelving units to hold or store groceries, food, kitchen supplies, files, documents, laundry, towels and linens. The adjustable leveling feet of our rack allow the shelving unit to be placed on uneven ground, while the distance between each basket can also be adjusted to your preference. In addition, the sleek silver varnish finish covering the surface protects against rust and corrosion, and is non-toxic, harmless, and odorless. If you need to get organized right away, why waste even more time setting something up? Assembling this storage rack is totally hassle-free: simply place the clips in the slots at a height of your own choosing, slide the baskets on top, and you are ready to go. The adjustable feet mean that you spend less time shimmying and balancing, and more time storing and organizing.